There are 3,293 x-marks on that chart. It’s a bit overwhelming, but you can see some patterns. For instance: the vertical streaks — like the one between 11:30 p.m. and 1 a.m. one night in late January — represent hyperactive stretches of texting. And you tell can I never texted between 5 a.m. and 6 a.m. all year. 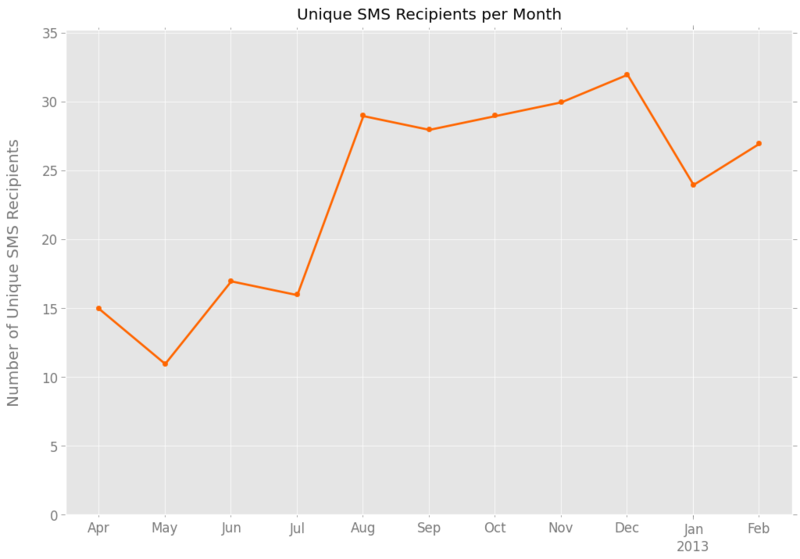 To get this data, I used the free SMS Backup & Restore app for Android. The program let me download all my texts as an XML file, which I then converted into a CSV. 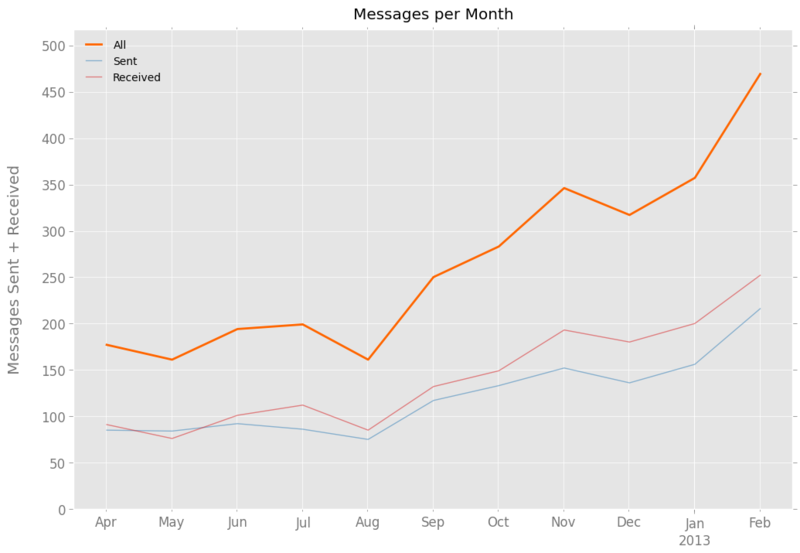 I’m only counting messages exchanged with “known” contacts — not spammers, wrong-numberers, or boarding pass–senders. The data contains at least three different types of variables — continuous, categorical, and time-based. To analyze and chart them, I got to use a couple of Python tools I’d been wanting to learn: pandas and matplotlib. 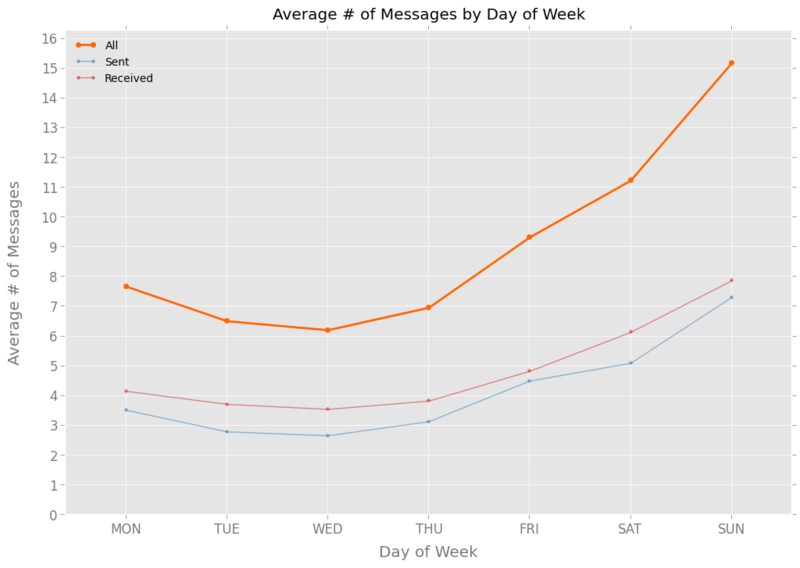 I sent 1,514 messages, or 4.1 per day, to known contacts. I received 1,779, or 4.9 per day. So for every 100 messages I sent, I received about 118. 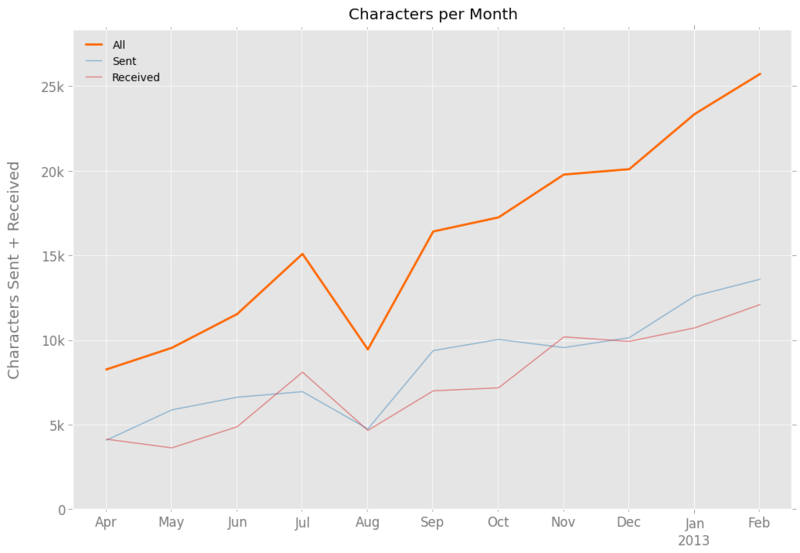 I sent 104,406 characters, or 286.0 per day.1 I received 92,610 characters, or 253.7 per day. So for every 100 characters I sent, I received about 89. Messages I received were, on average, 52 characters long. 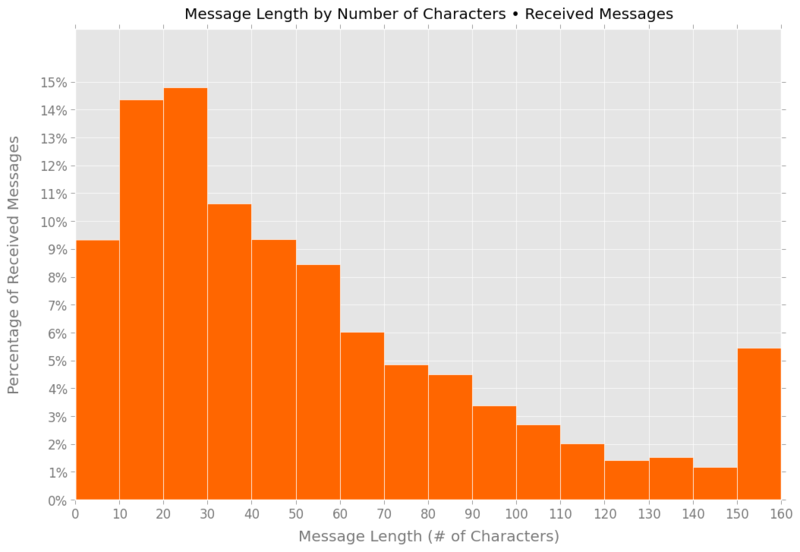 Messages I sent were 69 characters long, on average, or 32% longer than those I received. The skew is most apparent at the very-short and very-long extremes. 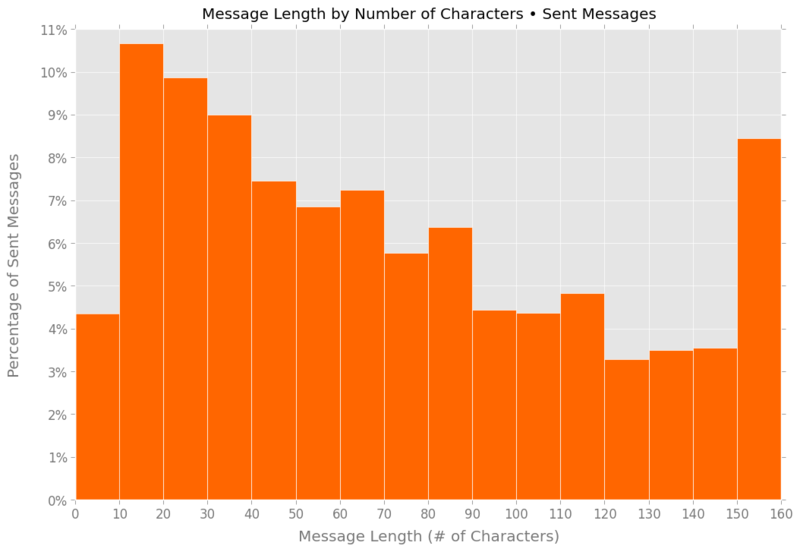 More than 8% of the text messages I sent were longer than 150 characters; roughly 5.5% of the messages I received were that length. 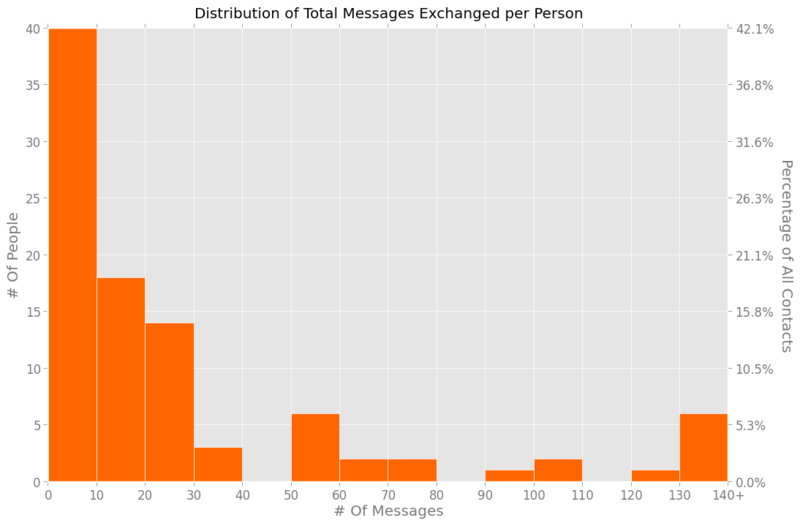 And less than 5% of the messages I sent were 10 characters or shorter; people sent me such super-short messages more than twice as often. I’m not surprised to see I sent longer text messages; I like jamming as much meaning as possible into a single message, and I don’t like abbreviations. But I had no idea I was so much more verbose than my friends, family, and coworkers. My apartment lost power the week Hurricane Sandy hit. 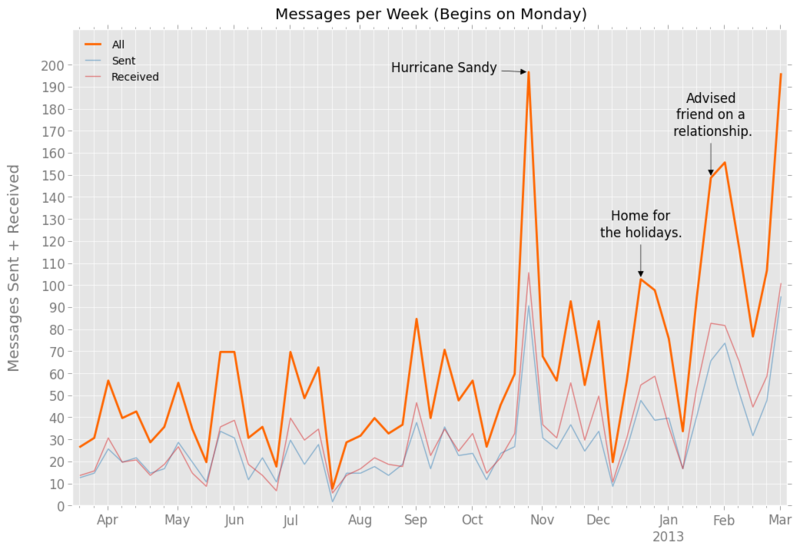 In the mornings and evenings, I conserved my phone’s battery by turning off the data connection and communicated more often by SMS than email. 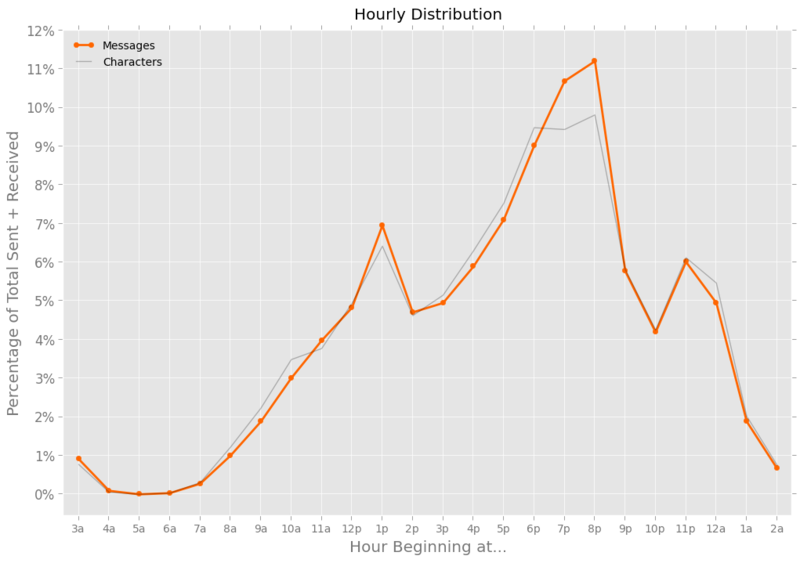 Follow the thick orange line, and you’ll see my text messaging increase from morning until dinnertime, and decrease through the rest of the night, with a couple of smaller spikes around lunchtime and the late evening. What happened in August, when that number nearly doubled? It’s hard to say. I would have expected that bump to come a month earlier — July was my first month in a new apartment, in a new borough, and out of a yearslong relationship. Perhaps those changes had no effect. Or maybe they just took an extra month to manifest. Whatever expanded my texting circle, it seems to have lasted. 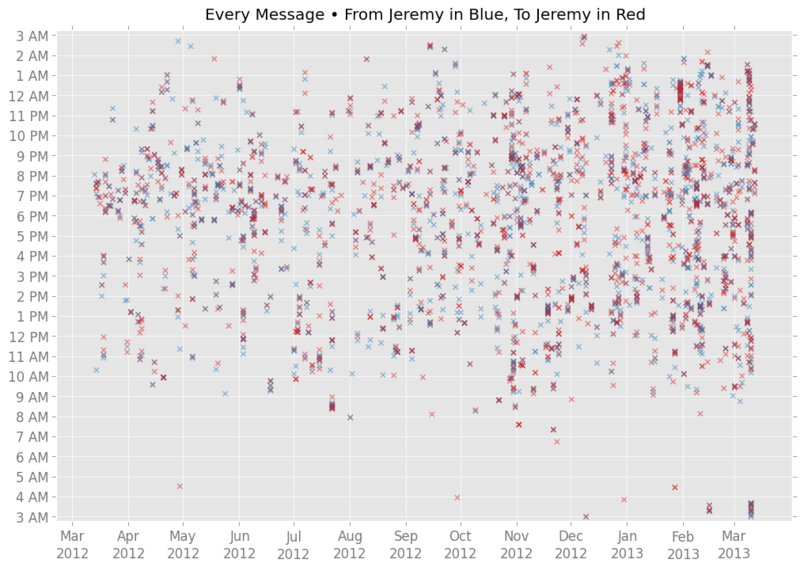 … and exchanged more than 130 messages with just seven people. I never to used “i”, and only received it a few times per 10,000 characters. 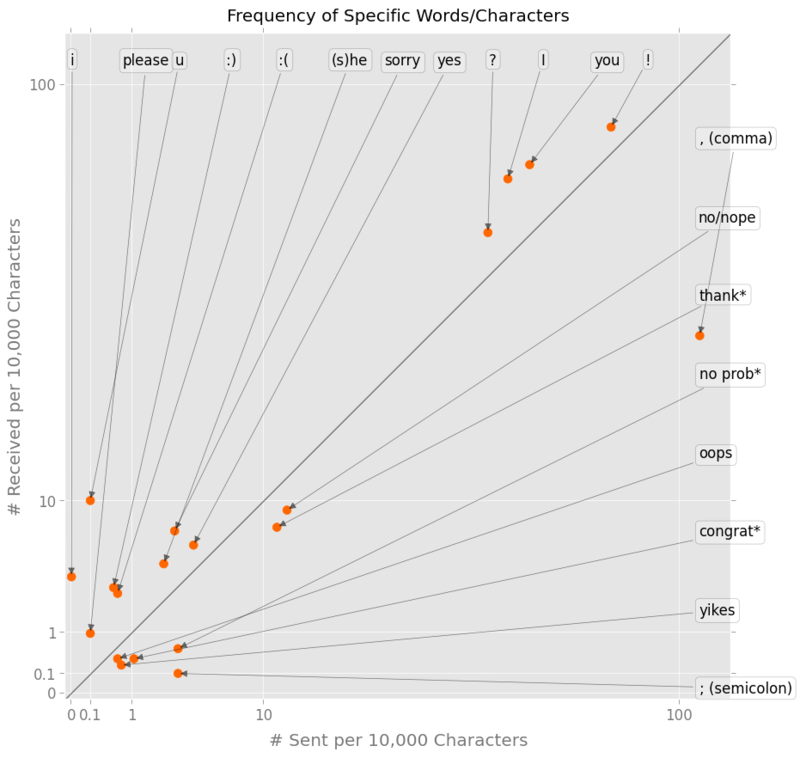 I used commas and semicolons more frequently than other people; they used “?”, “!”, “:)”, and “:(“ more often. I sent variations on “congrat(ulation)s” and “thank(s)” a bit more than them; they sent “please” and “sorry” a bit more than me. I used “he,” “she,” and “you” — and presumably other pronouns — less often. I don’t plan on writing shorter messages, using fewer commas, or reining in other idiosyncracies just to approximate the norm. But I might try shifting some texting from the evening to the daytime — will friends find this a pleasant surprise? — and try being more generous with emoticons.